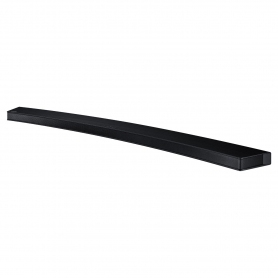 Take your sound system to the next level with the HW_J8500RXU 3.1 channel soundbar from Samsung. Whether you’re listening to music or watching a film, you deserve a fantastic audio experience. Why spend lots of money on a fantastic TV with great visuals, only to neglect your audio? 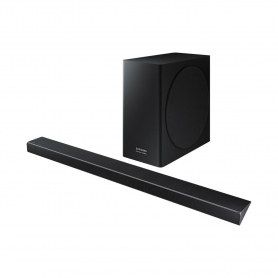 Soundbars are a compact way of dramatically improving your sound experience, and the HW_J8500RXU is no exception. The elegantly curved design is attractive and perfectly complements thin, modern televisions. Choose between this stylish black model and an eye-catching silver version here. With 350 W of power, the HW_J8500RXU offers higher quality sound compared to the built-in speakers on most modern TVs. With crystal clear audio and fantastic depth coming from the subwoofer, your new sound system will create an immersive entertainment experience like never before. It’s also capable of providing 5.1 channel sound as part of Surround Sound Expansion, for a truly breath-taking audio experience. While the HW_J8500RXU looks fantastic on your TV stand, you can also mount it on the wall with the supplied bracket. This is ideal if you’ve already mounted your TV on the wall or if you’re after a minimalistic look. 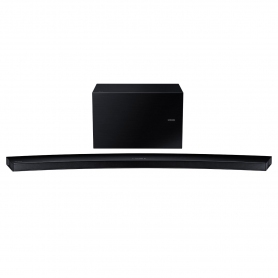 As the subwoofer connects wirelessly with the main soundbar, you get fewer trailing cables, which can clutter the look of your living room. If you have a compatible Samsung TV, you can connect the HW_J8500RXU wirelessly using TV SoundConnect. The HW_J8500RXU also features Bluetooth 4.0 and HDMI connectivity in addition to WiFi, so you can hook it up to a wide range of devices. Tune into your favourite stations thanks to Internet Radio or connect it with your home sound network with Multiroom Link to play music all over your house. 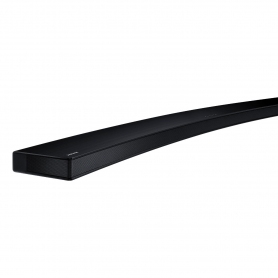 Get yourself the fantastic HW_J8500RXU soundbar from Samsung. Place an order for one today.